Tucson Happenings would like to thank FoodInRoot for their support! The demand for fresher, healthier, better food has spurred the growth of farmers’ markets around the country. At FoodInRoot, we believe technology can make farmers’ markets even better by helping to improve the accessibility, convenience, and enjoyment of finding and shopping at a local market. We are developing a platform to help farmers’ markets around the country thrive. This year, we are putting our system to the test in Tucson, with new farmers’ markets opening in underserved communities. The goal is to streamline the formula for a farmers’ market to better serve the market coordinators, vendors, and its patrons. Our markets have all the fun and feel of traditional farmers’ markets, with a uniquely modern touch. We started with an idea. A pretty simple one at that: make it easier to get information about the food you buy. Whether that is a chef at a restaurant ordering ingredients for the daily special or a mother shopping for her children, everyone has questions about their food. It’s challenging enough when you visit the grocery store and you are unsure of where the food comes from. Or perhaps you would like to know something about how the food was grown, and if the farm’s practices are concurrent with the standards for organic farming. Whatever your concern, we believe the solution to your problem is simple: local. When you buy local, you have the ability to get answers about your food. Often times directly from the farmers! Our focus begins with farmers’ markets, the ubiquitous place to shop for all things food related. We are working on building a better blueprint for a farmers’ market, to help new markets grow, and existing ones to flourish. We love the benefits it brings: providing fresher and better tasting foods, promoting health and wellness, creating sustainability in the environment, boosting the local economy, and having fun! As a community driven endeavor, there is something for everyone at a farmers’ market, and a reason to love it. Discover yours! Congratulations to all the amazing vendors, musicians, and especially the market patrons! We’ve again been voted the best farmers’ market of 2015 by Tucson Weekly and its readers. Check out our vendor list, and come visit us every Saturday and Sunday from 8a-12p. 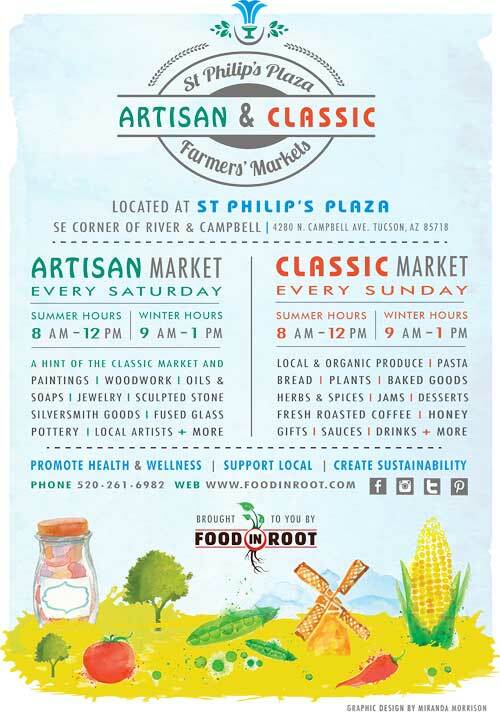 Take a look at this awesome video of the Sunday St. Philip’s Plaza Farmers’ Market! Filmed, edited, and produced by Art Lounge Productions.